They grow up to 18 cm / 7 inches fully grown. They live in water parameters of PH range 6.5-7.5 and temperatures of 17-24 Celsius / 65-75 °F. Black moors are lovely peaceful tank mates in cold water set ups. They are very slow swimming fish so should not be mixed with quick moving fish as they would struggle getting to the food before the others eat it all. They have large bulging eyes, but they do have poor eye sight so again feeding can be a problem. They eat flake goods, small pellets or granular foods. Sinking there food is best as if they eat of the surface they can gulp in air, and cause stomach bloat. This will make them swim upside down and cause them stress. A treat of freeze dried, frozen, or live foods can be good for them. 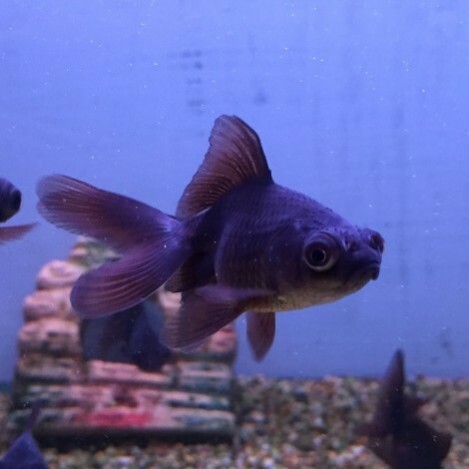 Black moor enjoy pellets or flakes in there diet. Just make sure the eat the food and sink it for them as not to cause stomach bloat. Live, freeze dried and frozen foods are also a nice treat.